Keeping hands clean and sanitized in hospitals and other medical facilities can be a challenging and inconvenient problem, with caregivers having to go to a sink or sanitizer station between each patient. Bloomfield Hills-based Sterilogy worked with a group of Grand Valley State University applied Medical Device Institute (aMDI) students to devise a series of devices to address that issue. 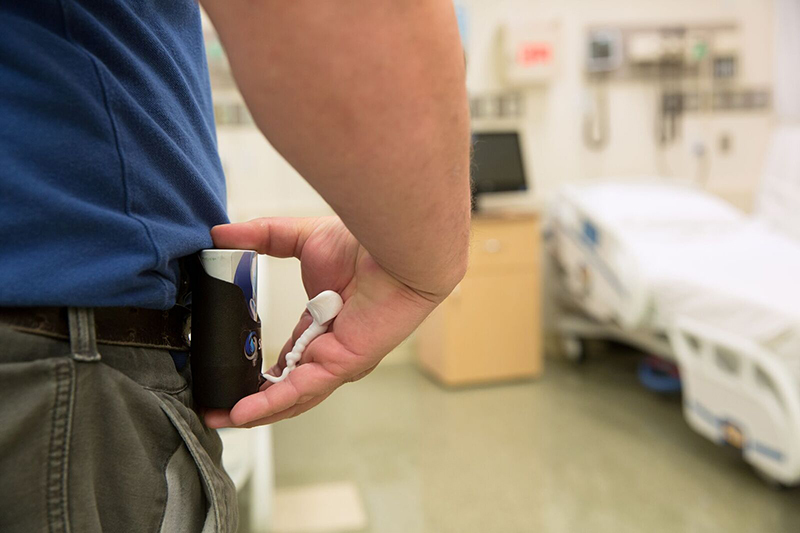 The three-device system — comprised of a personal sanitizer unit (PSU), a zone alert emitter unit, and a base station unit – was designed for nurses, doctors, and other health care workers who come in direct contact with patients. The idea for the system came from Dr. Bradley Ahlgren, an orthopedic surgeon and co-founder of Sterilogy. He says wall-mounted sanitizers are inconvenient and often empty, so he started carrying around canisters of sanitizers in his scrubs. Zaima enlisted the help of Grand Valley’s aMDI team in spring 2017 to design, build, and test a series of prototypes for the hand hygiene system. For example, the PSU is a body-worn device that dispenses the foam sanitizer. The zona alert emitter unit is attached to a patient’s bed and communicates with the PSU to remind health care workers to sanitize. The base station unit is placed at a central location, like a nurse’s station, and uploads data from PSUs when they are in close range. The aMDI team that developed the system included graduate assistants, undergraduate students, and a professor, Karl Brakora, from the School of Engineering. The group recently finished the first set of prototypes, and conducted demonstrations in a hospital patient room simulation unit at Grand Valley’s Cook-DeVos Center for Health Sciences. Zaima says the system also will help hospital administrators determine its compliance rate and improve workflow. He adds several hospitals in the Detroit area are interested in beta testing the new system, which has five patents granted and one pending. He says Sterilogy will continue to work with the aMDI team to fine-tune the current design in preparation for beta testing and mass production.